This recipe was submitted to the Better Homes and Gardens magazine by Marilyn Schmid. My kids loved to “help” make these by smashing up the Whoppers! Preheat oven to 375 degrees F. In a 4-quart mixing bowl beat butter with electric mixer on medium to high speed for 30 seconds. Add brown sugar, granulated sugar, baking soda, and salt. Beat until well combined, scraping sides of bowl occasionally. Beat in eggs, oil, and vanilla. Beat in as much of the flour as you can with the mixer. Stir in any remaining flour and the cereal. Bake for 8 to 10 minutes or until golden. Place cookie sheet on wire rack. 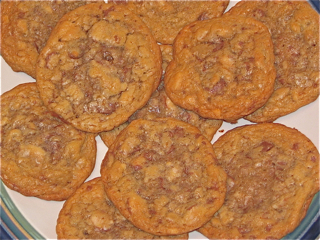 Immediately sprinkle tops of warm cookies with reserved crushed candies. Cool on cookie sheet for 2 minutes. Transfer to wire rack. Cool completely.